Clearly one of the most important things that you will have to do as a business is keep track of the number of sales that you are able to make. With this information in hand, you are going to be able to project into the future how much you are going to make, and how much you need to order for future customers. 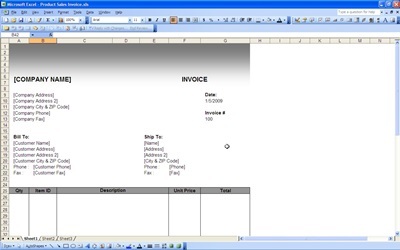 That alone should be enough to make you see why you need a sales invoice program on excel. Excel is the trusted business software of millions. The people who use this type of program are always making great accomplishments as a result of their use of this software. It helps them to keep things organized, and helps them with the calculations that are involved in the purchasing of various products. Based on this, it is easy to see why so many trust this program to do the work that they need it to do for them at all times. Do I Need To Track? Some small business owners feel that a sales invoice is a waste of their time. They do not like it because they feel that they could be spending their time more productively doing other things. They probably feel this way because they are not currently selling a huge amount of product. However the truth of the matter is that they do still need to be keeping track of the various things that they are selling at the moment. Failure to do this means that they are literally going to lose track of their sales numbers, and that is when things can get really bad. No one wants to be in the position where they literally do not know how much they have made in sales. The simple answer is that everyone needs to be doing a sales invoice.